This milestone poster/sheet details the speech and language developmental milestones for children from 8 years of age. 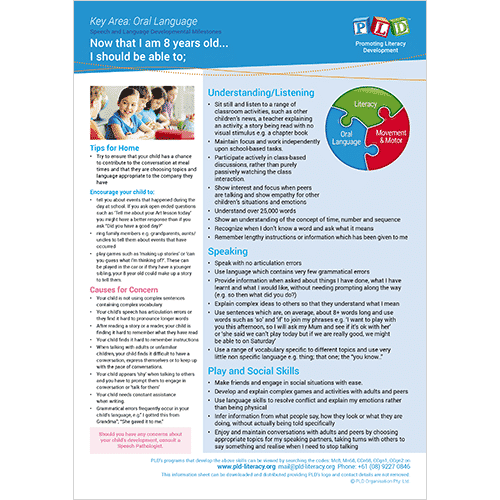 Download the A3 Speech & Language Poster or download the A4 Speech & Language sheet. 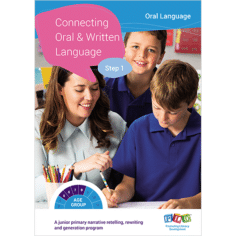 The following implementation booklet outlines how PLD speech pathology designed programs can be applied to schools. Refer to pages 7, 11, 12 and 18. Instructional material outlining how to teach 6 to 8 year olds narrative oral retelling, rewriting and generation.